Photo credit Chicago Zoological Society's Sarasota Dolphin Research Program. NOAA permit 18786-03. Mote Marine Laboratory is pleased to share the following story from NOAA's National Marine Fisheries Service. Credit all photos to Chicago Zoological Society's Sarasota Dolphin Research Program. The rescue was conducted and photos were taken under NOAA permit 18786-03. Sarasota Bay, FL - For the second time in three weeks a young dolphin is swimming free of fishing line thanks to the efforts of a rescue team made up of partner organizations along Florida’s west coast. During a routine field survey in February, biologists from the Chicago Zoological Society’s Sarasota Dolphin Research Program noticed the 2-year-old male dolphin looking underweight. A month later the animal looked even skinnier and had fishing line deeply embedded in its tail. 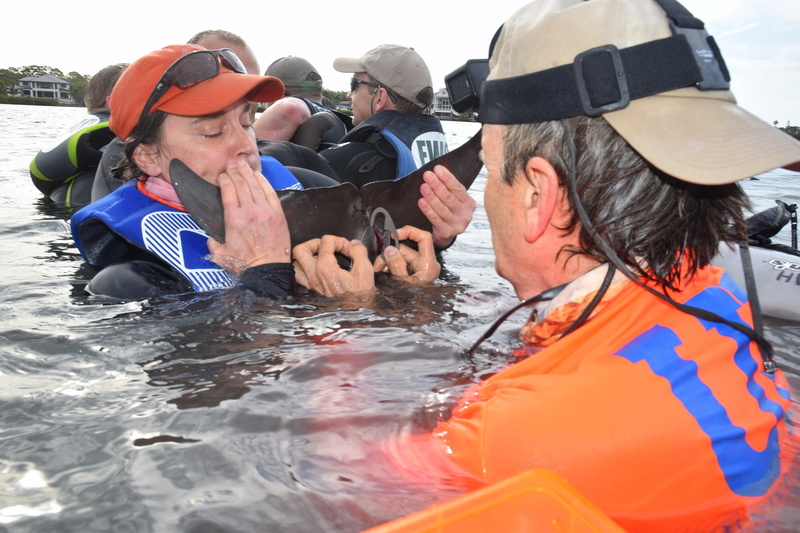 After collaborating with NOAA Fisheries, a rescue team was assembled to catch the dolphin, remove the gear, look at the animal’s overall health, treat it as necessary, and release the dolphin back into its natural habitat. This kind of rescue effort requires a lot of resources; in this case 8 boats and 48 people including veterinary staff, biologists, and trained dolphin handlers. Rescue team removes gear and conducts a health assessment. Biologists located the dolphin less than an hour after leaving the dock. It was alone, having separated from its mother over the past few weeks. Within 20 minutes the team was able to encircle the dolphin with a net in shallow water, begin removing the line and treating him. Treatment included an antibiotic shot. A short time later the dolphin was released, free of line. The monofilament fishing line, with the added drag from algae and tunicates (small marine invertebrates), had cut 85% of the way through the right part of the tail. With every tail beat, the line was cutting further and further through the tail. Once the rescue was complete the young dolphin swam away strongly. The rescue was conducted under a NOAA permit, and led by the Chicago Zoological Society's Sarasota Dolphin Research Program working in collaboration with partners including Mote Marine Laboratory, the Florida Fish and Wildlife Conservation Commission, the University of Florida’s College of Veterinary Medicine, Clearwater Marine Aquarium and NOAA Fisheries. In the following weeks biologists will continue to go out and monitor the calf's progress. Because this was the second disentanglement of a young dolphin from fishing line in only three weeks along the central west coast of Florida, scientists and wildlife officials are concerned the decline in fish populations from the recent red tide may be bringing mother dolphins into closer contact with anglers, creating situations where their young, naive calves can become entangled in fishing gear. Anglers are urged to be cautious if dolphins appear, to reel in their lines until the dolphins leave and to never feed or attempt to feed dolphins. Biologists use dorsal fins to identify dolphins. The best way to help marine life in trouble is to call trained responders, report your location and wait near the animal. Please call 1-877-WHALE HELP to report injured or dead marine life or use NOAA's Dolphin and Whale 911 phone app. The rescue was conducted under NOAA permit 18786-03.